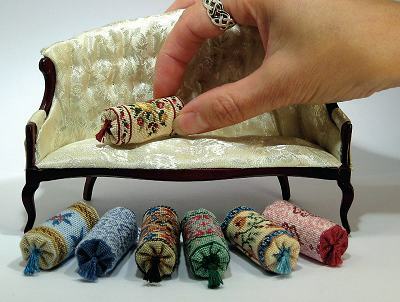 If you have ever looked for a carpet, rug or some cushions for your doll’s house (as I’m sure you all have), the chances are you have been enticed by one of Janet Granger’s many needlepoint kits. 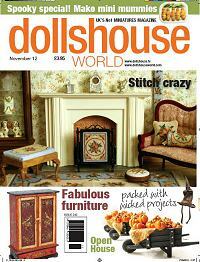 Her enthusiasm for stitching began as a child and she has been running her successful business for sixteen years. In 1984 Janet bought a Georgian doll’s house and started to decorate and furnish it. “At the time there was hardly anywhere to buy carpet kits, so I thought I’d have a go at designing some myself “. 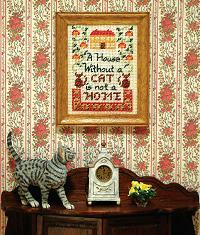 The designs worked well and eventually led Janet to launch her full time business in 1996, following publication of her book ‘Miniature Needlepoint Carpets’, sadly no longer in print. She was ready for the hard work that running your own business entails. My husband still thinks it’s great but my parents think I’m crackers! Janet had started her working life in public libraries, where she loved the books and enjoyed meeting the public. She didn’t like the limitations of working for a large organisation though and her own business has given her a lot more flexibility. There is no ‘typical’ day at Janet Granger Designs but this suits Janet well. “I love that my work doesn’t follow an organised pattern. The company is run by Janet and her husband Chris. As Chris is good with the technical side of things, they were one of the first miniatures businesses to have a website. When they allow themselves time off from the business, Janet and Chris have a hobby that involves travelling all over the UK. “I love doing Dances of Universal Peace” Janet told me. “It is a form of spiritual dance, a bit like circle dance with singing, celebrating all kinds of religious traditions. 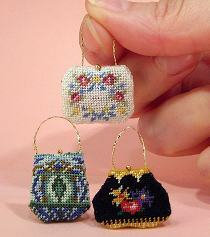 Janet believes her needlepoint kits are unique in that everything a customer needs to complete their order is included. 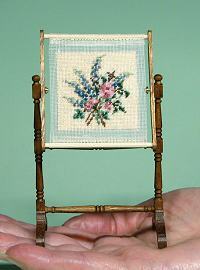 “Even metal bell pull ends, wooden tapestry frame pieces or wallhanging poles. The instructions supplied are very detailed but if you really get stuck, visit my website. There are online tutorials, showing exactly what you need to do to assemble your kit.” Many of Janet’s designs come as part of coordinated collections, so mix-and-match designs form a large part of what she has to offer. All the kits and charts are available from www.janetgranger.co.uk or by post from Janet Granger Designs, Rose Cottage, Leek Road, Waterhouses, Staffordshire, ST10 3JS. A paper catalogue is available for £2.50 or available as a free download from the website. I am sure that one visit to the catalogue or online store won’t be enough and like me, you will have to go back again and again.